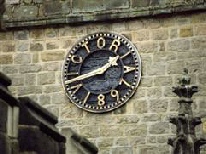 We start our guided tour of the area in the very popular spa town of Buxton before moving around the hillside towns and villages including Hartington, Osmaston, Longnor, Chapel-en-le-Frith, Alfreton, Matlock and the rather bizarre plague village of Eyam. The show ends with a sequence of landscapes which show the true beauty and majesty of the Peak District. Many of the phone boxes in the Peak District are painted grey to merge more discreetly with the countryside - and the sky ! 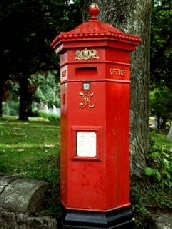 A nice Victorian pillar box opposite The Opera House. 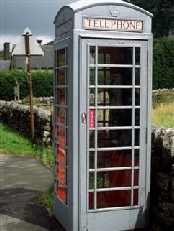 Similar boxes are fairly common including one at Hartington. The landlord's wife moaned and nagged so much that he cut her head off with a sword. Peace - perfect peace ! ! A grisly stone marking the spot where a terrible murder took place. 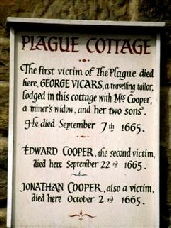 He came from Eyam - 160 years earlier and he would have been killed by the plague. 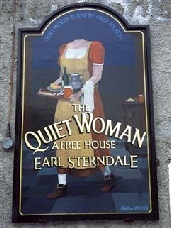 Just one of many such signs appearing on cottages in this village. The story of the village in quarantine is well known but I must admit I found that reading all the signs recording all the deaths rather depressing. Too much Buxton mineral water, I reckon. 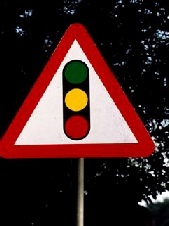 You'll find this on the B5053 North of the village. Not quite right, is it? 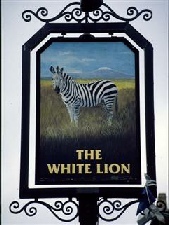 I am told the pub signwriter could not draw lions so he was told to draw the next best thing. He came up with a zebra because it had lot of white ! 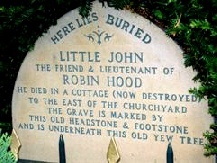 Little John's grave in the church yard. 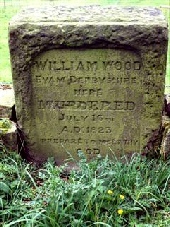 I sher wood like to find Robin Hood's grave ! ! 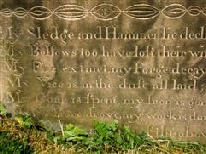 The Blacksmith's epitaph. "My sledge and hammer lie declin'd. My bellows too have lost their wind"